We’re on our way to creating an affordable and replicable model for the provision of a safe, ecologically beneficial city-wide sanitation, and we’ve got news to share! In September 2017 we excitedly announced that SOIL was selected as a Finalist for the ReSource Award. This prize acknowledges social entrepreneurial initiatives aimed at scaling up new approaches for solving social or ecological issues related to sustainable water management. We’re still under consideration for the final award (keep your fingers crossed for us!) but in the meanwhile, we’re happy to announce that this award has already had a tremendously positive impact on SOIL. The ReSource Award came with coaching support from cewas and a $20,000 cash prize. Over the past four months, SOIL has been working with our cewas coaches to evaluate the best pathway to sustainable scale up, analyze the risks and assumptions of our business model, and productively plan for the future. The funding from the ReSource Award represented a significant and much needed contribution to SOIL’s budget. A large portion of SOIL’s funding is restricted to particular project activities and prize funds like the ReSource Award have an outsized impact on our ability to ensure an uninterrupted focus on the research and development that’s necessary to drive SOIL’s work forward. 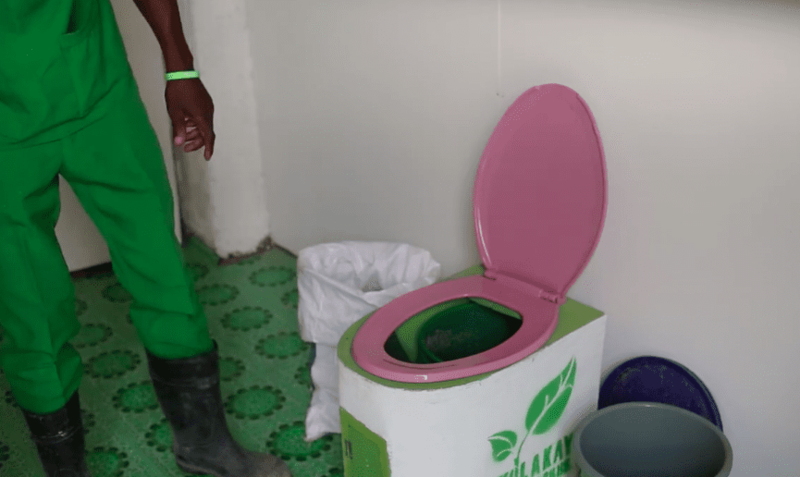 SOIL’s flagship social business, EkoLakay, affordably provides dignified container-based sanitation (CBS) services to Haitians living in resource-poor urban communities. This program has gone from a pilot project in 2013 to a service which today provides more than 6,100 urban residents with safe access to household sanitation. How does it work? For a small monthly fee, EkoLakay provides families with toilets, weekly waste collection, and the safe treatment and transformation of wastes into compost. To date, SOIL has produced 200 tons of compost in a process that exceeds standards set by the WHO for safe treatment of human waste, establishing a circular economy model that also addresses soil erosion and deforestation in Haiti. Over the past four years SOIL has refined the Ekolakay service delivery model, improved the toilet and waste treatment technology, and implemented cost reduction strategies like the introduction of mobile payments. SOIL’s model is one of the few such services globally that has grown beyond the pilot stage and showcases the potential to affordably provide household sanitation even in the most water-scarce and resource-poor urban communities in the world. With the support of our ReSource Award coaches, we took a hard look at our business model and worked to refine it for scale up with a blended-revenue approach incorporating individual contributions, private sector revenues, and innovative public financing. With the guidance SOIL received at the ReSource Award coaching week and the ongoing support that has followed, SOIL developed a risk management plan that identified and ranked risks to the success of our scale-up. We then used some our award funding to set aside staff time at all levels to review the assumptions and risks of our model and take action on appropriate risk mitigation measures. 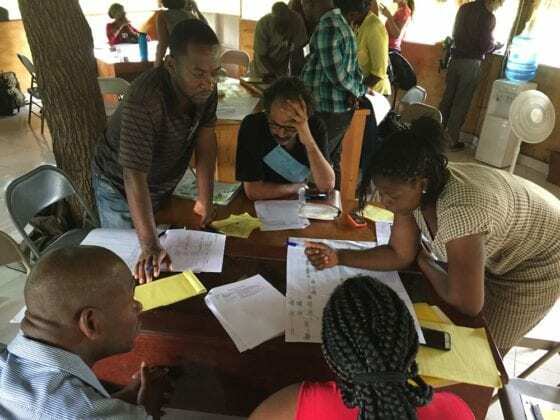 In partnership with the World Health Organization (WHO), our colleagues in the Container-Based Sanitation Alliance, and Haitian government representations, SOIL has been working to develop Sanitation Safety Plans (SSP). As container-based sanitation solutions pick up steam as an improved sanitation solution for growing urban communities worldwide, it’s important to develop national and international mechanisms that ensure safe implementation. We ultimately believe SOIL is poised to leverage the financial support and coaching provided by the ReSource Award to revolutionize the approach to sanitation provision, proving a scalable and replicable model with the potential to provide sanitation access for the millions of people living in urban communities globally who currently lack sanitation. And we don’t give up easily! 2 Replies to "ReSource Award Supports the Growth of SOIL’s Business Model"
David and Beatrice Hines heartily congratulate SOIL for its perseverance and initiative in improving the lives of Haitians through its expanding social enterprise of providing and servicing Ekolokay toilets for residents of Port-au-Prince and Cap-Haitien, transforming human waste into nutrient-rich soil, thereby bolstering Haiti’s agricultural sector and combating poverty and inadequate sanitation simultaneously. On behalf of Sasha and SOIL’s entire team in SOIL – thank you! Your encouragement and support means a lot to us and helps keep us going!